his will modify the build process to ensure that MvcBuildViews is performed before publishing (by default, it is performed after publish step) and will allow to drop an error from compiler about web.config. However, it will still not produce precompiled IL for views and the application must build it on runtime. 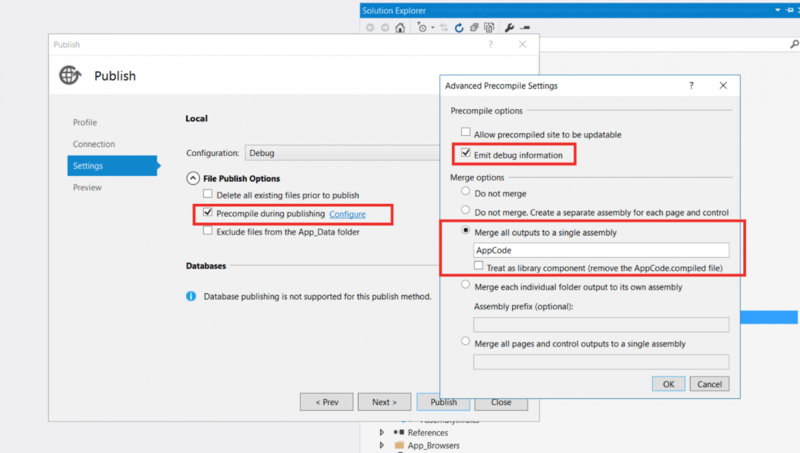 It turns out that the Visual Studio team already thought about those, who wish to use precompiled views and embedded set of parameters to be set to achieve this goal, which is invoked on publish of web application. So, it pushes us to using out-of-webroot development, which is beneficial for all (allows to tackle edge cases, encountered during publishing to production; makes your solution smaller and isolates delta of your custom work on top of the vanilla install), because view precompilation alters *.cshtml files (they are left there as a placeholders, with placeholder text). Then I tried to publish my web app and … it fails. Due to some historical reasons, we’ve included both umbraco and umbraco_client in the solution, which lead to a precompilation failure. There are several ascx files, which are referring to backend code which is not present anymore. 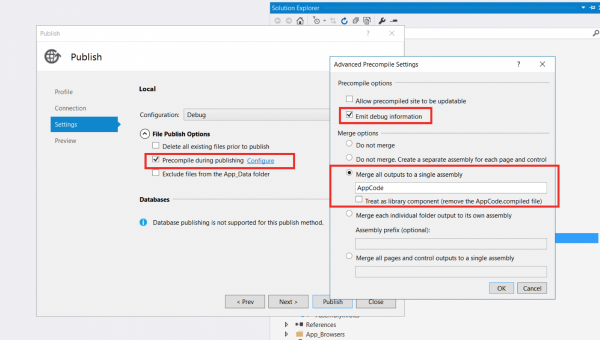 However, if Umbraco is installed via a NuGet package – it is not needed to include umbraco and umbraco_client folders in the solution, because nuget will import a set of tasks, which is responsible for copying umbraco and umbraco_client content to web deploy package and solution root during build. So, I excluded those folders again, and … it failed again. This time it failed because we have had some plugins installed and included in our solution, which was using masters from umbraco folders. I Included those masters files – and this time, precompilation was OK. I expected that after publishing my app will start up fast and will not spend any time on runtime precompilation, but – I received YSOD, stating that App_Code folder is not allowed in precompiled applications. I checked filesystem and found out that App_code with some cs files is present there. It turned out that we have had some cs files, marked as content in this folder and used by nuPicker. I changed their attribute to ‘Compile’ and published once again (clearing target folder manually, as my publish profile says to keep existing files by setting DeleteExistingFiles to False – this is needed as we have a separate frontend build, which uses Gulp for generating it). After that, application shown up and startup time improved greatly (though, initial index build requires some time, but subsequent publishes result in fast application start). As you can see – after build it will copy all dll’s from project bin to published folder, where precompiled app resides. So, if one has not changed anything in views – he does not need to launch full publish, but just build the solution. 2. Another possible solution, which also addresses catch number 5 and can be used to test load balanced solution is to add 2 IIS sites: one is pointing to published folder, and we will use it to check web app performance, check changes in code and views to be displayed correctly, second – pointing to folder with MVC project, which we will use to access Umbraco. In such approach, besides all other benefits, we can easily test load balanced approach (changing content in Umbraco shall be reflected in our published precompiled web app, events shall be called on both web apps and etc). Despite the fact, that we are publishing in Debug mode and are adding DebugSymbols (see publishing profile) – views could not be debugged when debugger is attached to published web app process. Hence, Jeroen came up with a solution, described as point 2 in Catch 4. At this moment, I could not figure out how to debug views in precompiled application – maybe someone can come up with suggestions? Our Umbraco based web app has the following setup: it is storing images at Azure blob storage via UmbracoFileSystemProviders.Azure, processes them via ImageProcessor and serves them via Azure CDN with the help of Our.Umbraco.AzureCDNToolkit. Final problem we faced was – our web app was not able to serve media directly from our virtual path provider (VPP), without processing it via ImageProcessor. So, all request like http://mydevhost/media/1000/1.jpg was serving ASP.NET 404, while requests like http://mydevhost/media/1000/1.jpg?1=1 will be happily picked up by ImageProcessor and processed further. Not a big flaw, and, in some setups, it can be even treated like an additional source of protection for original images (imagine that you do not want to serve original media items for your end-users in any circumstances). Actually, this is by design: http://msdn2.microsoft.com/en-us/library/system.web.hosting.virtualpathprovider.aspx notes that VPP will not work in precompiled web application. However, in this forum thread I came up with an answer how we can hack it and allow usage of particular VPP in precompiled application. After this, my builds were green again and I got a precompiled application also on our production environment, which is boasting faster startup times after IIS recycle or VM restart for updates installation.